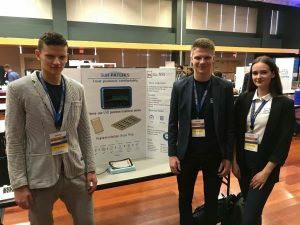 Sun-Patches, an innovative idea for psoriasis treatment conceived and introduced by a team of Kaunas University of Technology (KTU) students was named the 3rd Best Overall Innovation in Silicon Valley Innovation Challenge. Psoriasis is one of the most common autoimmune diseases; 3-4 per cent of the world population is suffering from it. In Lithuania more than 120 thousand people have psoriasis. “I have seen psoriasis in my family, and I know that many of the treatments for this condition are inconvenient, and often – inefficient. Psoriasis patients suffer from both physical and psychological ailments, therefore, the aim of our project is to help them in everyday situations”, says Edgaras Kloniūnas undergraduate student at KTU School of Economics and Business. Interdisciplinary Sun-Patches team consists of students from faculties of Mechanical Engineering, School of Economics and Business and of Chemical Technology. Edgaras Kloniūnas, Aurimas Mazūras, Gertrūda Nariuševičiūtė, Šarūnė Vaidelinskaitė, Giedrė Lažauninkaitė, Simas Borkertas and Edvinas Meižys met and started to work in a group during the Technology Entrepreneurship course in autumn 2019. “All the members of the team are highly motivated and knowledge-thirsty. Since September, after finding out about the possibility to participate in the innovation challenge they were working with great devotion and responsibility. Some of the students of the team are professional sportsmen who are aware that the result is dependent on the effort. The winning of the competitions proves this motto”, says Rita Jucevičienė, associate professor at KTU School of Economics and Business, the mentor of the students. In Silicon Valley, the teams had 3 days to prepare for the pitch. Jucevičienė says that students were working 14 hours a day in order to present their idea in the best possible way. “There were around 200 ideas from social, medical, educational, sharing economy, sustainable development and other fields competing in the challenge. To become the 3rd Best Overall Innovation is a great achievement”, says Jucevičienė. The KTU team was awarded USD 500 prize. At the moment they are looking for potential investors who could contribute to the further development of the idea. Silicon Valley Innovation Challenge is organised by San Jose State University, USA annually. Last year the KTU team’s innovation NanoLens, dissolvable lenses for glaucoma treatment won the 2nd place in the Challenge.